The creator of such B-movie classics as "It's Alive," "God Told Me To," "Q--The Winged Serpent" and "The Stuff" talks about his eclectic career and being the subject of the new documentary ''King Cohen: The Wild World of Filmmaker Larry Cohen," premiering this weekend at the Fantasia Film Festival. The problem with a lot of B-movies is that they have a tendency to promise far more than they can ever hope to deliver--many of them have premises that sound neat in theory and can even throw together a poster or trailer promising wild thrills and shocking sights but in most cases, more effort and imagination seems to have gone into the ad materials than into the film itself. One exception to that rule is legendary B-movie maven Larry Cohen, His films featured concepts that were impossibly ambitious--killer mutant babies (''It's Alive''), a giant Aztec-era serpent attacking New York while hiding out in the top of the Chrysler Building (''Q-the Winged Serpent''), a wildly popular dessert that takes over the minds and bodies of all who consume it (''The Stuff'')--but not only did he make them all pay off in the end, he also managed to include smart and funny dialogue, clever social commentary and excellent performances from highly eclectic casts into the proceedings as well. Although he may never have quite reached the level of prominence of the likes of George Romero, John Carpenter or other genre filmmakers of his era, his films continue to pack a punch today and are well worth rediscovering. Cohen has had a long and varied career that has seen him working first in television as a writer on shows like ''The Defenders'' and the creator of ''Branded'' and ''The Invaders'' before moving to films, first as a screenwriter on things like ''Return of the Magnificent Seven'' and the startling abortion-themed thriller ''Daddy's Gone A-Hunting'' and then going to do make his own films in order to protect his screenplays from potential meddling from directors and studios. (He still does the occasional screenplay for others to make, including ''Phone Booth'' and ''Cellular.'') His life and work is chronicled in the new documentary ''King Cohen: The Wild World of Filmmaker Larry Cohen,'' in which filmmaker Steve Mitchell and a group of commentators that includes the likes of Michael Moriarity, Robert Forster, Tara Reid, Martin Scorsese, J.J. Abrams, Barbara Carrera, Yaphet Kotto look back at his decidedly eclectic career. In anticipation of the film�s world premiere at the Fantasia Film Festival in Montreal this Saturday, part of a celebration that will also see him receive a Lifetime Achievement Award and introducing screenings of some of his classic films, Cohen got on the phone to discuss his career, the documentary and his future plans. What was the first film that you can recall seeing that made a real impact on you? As a kid, I went to see every movie that played and usually sat through them twice--I would stay in the theatre until the manager came by and threw me out. I loved the Warner Brothers movies--James Cagney was my favorite actor. The movies that I liked as a kid do not necessarily correlate with the movies that I have made myself. One of my favorites was ''Yankee Doodle Dandy'' with Cagney, who I thought was sensational. ''Angels with Dirty Faces''--stuff like that and ''The Roaring Twenties.'' I liked movies that were directed by Michael Curtiz--he was the leading director at Warner Brothers. It was a great studio--they had really ballsy movies and political movies. They had tough guys like Bogart and Cagney and George Raft and Errol Flynn. I was really partial to their movies. They were very energetic movies. They were shot at a fast pace with a lot of action and fast talk, as opposed to MGM movies, which were a lot slower and luxurious. Those were slow and the music was slow while at Warners, there was Max Steiner. In your career as a filmmaker, you have served as a screenwriter, producer and director. What is your favorite part of the filmmaking process? I like it all. I was fortunate enough to be able to be in a situation in which I could do everything, including the editing and even the main titles. I supervised the special effects by myself, much to the chagrin of some of the special effects people who felt that I should communicate with them before making the movie and storyboard everything instead of just going out and shooting the sequences and then telling them where to put the monster. They didn't like it but they made it work. I guess I just didn't want to let anyone else have a job. Many of your best-known films have been works that have combined familiar genre tropes, especially involving science-fiction and horror, with pointed social commentary about such real-world subjects as race, class, religion, consumerism and the like. In those cases, when you are first developing a project, do you first think of the plot and then try to find a social issue to tie in with it or do you do the opposite or does it simply vary from project to project? When I was writing for television preceding my movie career, I wrote a lot of politically oriented scripts, mostly for a show called ''The Defenders,'' which was the #1 show at the time and which won the Emmy award every year for about 4 or 5 years. I wrote a lot of political dramas and when I moved over to doing my own films, I always tried to have some kind of political concept as the subtext. When I did my own TV series, ''The Invaders'' and ''Branded,'' they were both politically texted dramas. ''Branded'' was about a blacklisted cowboy trying to live down his reputation as a coward and ''The Invaders'' was about the infiltration of an alien force--not necessarily communists--into American society in an effort to take things over. They were both political dramas disguised as entertainment. When I went into movies, I started out with ''Bone,'' which was about racism in America but done with a comedic touch. I followed that up with a couple of black exploitation films which weren't really black exploitation films at all--they were more like black versions of the old Warner Brothers gangster movies--and they had some political connotations too and they seem pretty up-to-date now when you look at what is going on between the police and the black community because that is what these movies were about. ''It�s Alive'' was a movie that was really about reflecting the abortion controversy and that is still up-to-date now because they are still arguing the abortion issue 45 years later. Racism and abortion are probably the two biggest hot points in the political culture today. Absolutely. I have done about 4 or 5 screenplays, not just the ones that I have directed, that have dealt with abortion to some degree. Even the film I did called ''Perfect Strangers,'' where the guy is contemplating killing a child, was kind of a reflection on the disposing of unwanted children in the most expedient way--of course, that is absurd but it is inherent in the whole abortion discussion. I don't preach any kind of behavior to anybody, so you have to take from the movies what you wish. Was there ever some kind of important social concern that you wanted to deal with in one of your projects but could never come up with quite the right vehicle to make it work? I was trying to make a movie about Charles Lindbergh and the career that he had, first as one of the most loved men in America because of his great flight and then as one of the most hated because of his right-wing behavior that was deemed to be pro-Nazi. I though that was an interesting political statement but I could never get the picture made. While working purely as a writer in television and in film, was moving into directing something that you had planned on doing from the outset? I always had problems with directors who would come in and put their stamp on the material and usually ruin it. I wasn't happy with the movies that were made from those scripts that I sold and I was looking forward to a very unfortunate career of disappointments. My ex-wife said to me ''Why don't you just go out and make your own movies? That way, you won't have anything to complain about.'' She bought me a director's viewfinder as a present and encouraged me to go out and put together my first movie deal. Ever since then, that is what I wanted to do. I have written scripts for other people over the years, frankly just for money because I hate to turn down a job, but my interest is in making my own movies. One of the great things about going back and looking over your movies is to see just how wild they are--not simply in terms of the bizarre storylines but in terms of their actual production. Even though the films were relatively low-budget, they were still highly ambitious in scope and contain some scenes, such as the parade sequence in ''God Told Me To'' where you stuck Andy Kaufman into the actual St. Patrick's Day parade as a cop who starts firing at the crowd, and the climax of ''Q'' where you have real people hanging out of the real top floors of the Chrysler Building while firing real blanks. Considering that there is no way that you could possibly do any of that these days, are you ever surprised while looking back at your films that you were able to get away with the things that you did? I think of that all the time. I get asked if I would dare to do that today--of course, I know I couldn't do any of that today because of all the security and fear of terrorism. They aren't going to let you run through the streets of New York with a gun in your hand unless you want to get shot down. Obviously, we couldn't infiltrate the St. Patrick's Day parade with Andy Kaufman with a gun in his hand and do all the action that was predicated there--we would probably all wind up going to jail for at least five years. We had permission to shoot the guns off the top of the Chrysler Building and the guys firing the shots were, for the most part, off-duty New York policemen. Still, it provoked a lot of confusion because the local Channel 11 reported that we were firing machine guns at the United Nations building as part of some kind of terrorist attack. Of course, lots of newsmen converged on the Chrysler Building because of these erroneous reports and the stories and the headlines got out in the newspapers that we provoked panic in the city and all that stuff. That was all an exaggeration. However, we weren't supposed to be up that high in the building and we weren't supposed to be in the tip of the needle. I just kept climbing and bringing the crew with me--I didn't think they'd follow but they did--and we ended up shooting at the very pinnacle of the building. You could feel the whole building swaying back and forth. It isn't a fake and it isn't CGI or a set. It is the real McCoy and believe me, I do not particularly like heights but when you are making a movie, you don't think of anything but making the movie. I figured that if I went up there, they would follow and they did. You have worked with an eclectic array of actors throughout your career, including such cult favorites as Michael Moriarity, Richard Roundtree, David Carradine, Yaphet Kotto and Fred ''The Hammer'' Williamson. You also got a chance at certain points with stars from an earlier generation, including the likes of Broderick Crawford, Dan Daileyl Celeste Holm, Lionel Stander and, perhaps most infamously, Bette Davis. Perhaps not counting the experience with Davis, who left the production of ''Wicked Stepmother'' about halfway through shooting and never returned, what was it like for you to work with these particular stars? We had a lot of Oscar winners in our movies. I particularly liked ''The Private Files of J. Edgar Hoover'' because there were so many veteran actors in it that I had admired as a kid like Lloyd Nolan and Celeste Holm and Crawford and Dan Dailey. These were people that I had loved in the movies when I was growing up and I never thought that I would get a chance to work with them. Jose Ferrer, who I had seen on Broadway many times never thinking that I would be working with him. Sylvia Sidney, who was in ''God Told Me To,'' was a very, very big star in her day--she would appear opposite Spencer Tracy or Henry Fonda or Humphrey Bogart and get top billing over them. Some of the pure fun of making these movies came from dealing with these people. I always got along with them and they always loved the experience. Even Bette Davis--I never had a harsh word with her and she was hugging and kissing me right up to the last day when she left the set. It was just unfortunate that her dental problems prevented her from returning and finishing the picture--if your teeth don't work, you can't say the dialogue. Most of the films that you have done over the years have fit into fairly identifiable genres, mostly horror or action. There have been a couple of instances when you have stepped away from those genres to do something a bit riskier, like the period docudrama ''The Private Life of J, Edgar Hoover'' or the sweet werewolf-related comedy ''Full Moon High.'' Was it harder to get those films made because you weren�t working with the safety net of a recognizable genre framework? Believe it or not, I did not have trouble getting those films financed and they also went into profit. Every picture I made for American-International Pictures went into profit and I have been collecting money on them for forty years. It is unusual for any movie to go into profit but for every picture that we made at AIP to do it was amazing. Everybody told me how much comedy there was in my movies and how much they liked the comedy aspects, so I made ''Full Moon High.'' I thought that it was a very amusing picture and I got wonderful people in it like Alan Arkin and Ed McMahon and a wonderful cast. The lead, who was the son of Alan Arkin, Adam Arkin, has become one of the leading directors working in television today on all the top cable shows. Even after having established yourself as a filmmaker, you have still on occasion done screenplays that others have wound up directing, such as ''Best Seller,'' ''Maniac Cop,'' ''Guilty as Sin,'' ''Phone Booth'' and ''Cellular.'' What are your thoughts on how these particular projects turned out? Well, I got them to make ''Phone Booth,'' which was a success and it was a very unusual film in that it took place entirely within a telephone booth. I was very pleased that the picture got made, though it would have been better if I had made it. I do think that Joel Schumacher did a reasonably good job and he did listen to me when I made some suggestions, which I appreciated. ''Cellular'' wasn't exactly the same as the script I originally wrote--a lot of the teenage stuff was superimposed on the picture by another writer, who was a very nice fellow. I don't usually write stuff for teenagers. Other than that, the structure was quite good. What is even more interesting is the film that was made from it by the Chinese that was called ''Connected'' and it is even better than the American version. The remake of ''It's Alive'' was so dismal that it was never released. It was made in Eastern Europe and it was just terribly produced. Even the head of the studio that made it apologized to me on the streets of Beverly Hills one day. What are you going to do when someone like Avi Lerner apologizes to you? It is not usual to hear him apologize for anything and so I immediately accepted his apology. It was a really miserable picture. I don't know if they are going to get the ''Maniac Cop'' remake made or not but they didn't ask me to write it. I wrote the previous three--the first two were good and the last one wasn't because they began monkeying with the script. You have never really done any remakes to speak of in your career, with the exception of the work that you did on ''Body Snatchers,'' the ''Invasion of the Body Snatchers'' remake directed by Abel Ferrara. . . I went to Warner Brothers with the idea of doing a ''Body Snatchers'' movie on a military base and that got the project off the ground. Except for about four or five scenes, the Ferrara version was totally rewritten by somebody else, though they did keep the concept that I introduced and a few key scenes. Other than that, I didn�t really have that much to do with Abel Ferrara. How did the whole ''King Cohen'' documentary project come about? It came about because I got a call from some very nice people who wanted to make a documentary about me. Who am I to refuse? They went out, with my permission, and started making it. I didn't have that much input into it or supervise it or impose my creative will on the project. I've gotten to the point where if I am working on something, I want to be in total control of every aspect and I didn't want to interfere with these people--I wanted them to make whatever they wanted to make. They went out and got the people together that they interviewed and the clips that they gathered from my movies. I am looking forward to seeing it in Montreal as I have never really seen the entire thing all put together. The last thing that you directed was an episode of the ''Masters of Horror'' anthology series about a decade ago. Is there anything that you are working on right now that you can speak about? If someone had never seen any of your films before but was interested in taking a look at your work, which of your films would you steer them towards if you could? That is a hard question to answer because your films are like your children--if someone asks you which is your favorite child, it is very hard to answer that. My films all have a feeling of warmth and nostalgia about them because of the situation during which they were made. I had some wonderful relationships with the actors and the locations that I cherish and they may not be my favorite movies but there are things about the making of the movies that are particularly charming in the remembering. I think people would want to see ''Q'' because of Moriarity's performance and the Chrysler Building and ''The Stuff.'' I also wish they would see ''The Private Life of J. Edgar Hoover'' because I think it is one of the best movies ever made about American politics and it has so much to do about the FBI today and the president and all that nonsense. That film is really apropos and so much better than the one Clint Eastwood made. Although pretty much any film with Larry Cohen serving as writer and director is worth a look for any self-respecting fan of off-beat cinema, here are a few that those unfamiliar with his work should definitely make a point of seeing. 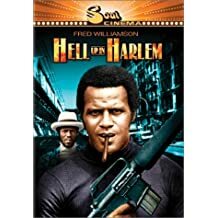 HELL UP IN HARLEM (1973): By most standards, this quickly made sequel to Cohen's blaxsploitation gangster hit ''Black Caesar''--which was made despite Fred ''The Hammer'' Williamson's central character dying at the end of the previous film, is not one of his standout efforts and even Cohen himself admits that its production was driven more by greed than anything else. However, it does contain one of the craziest sequences in any of his films--Williamson is pursuing an opponent on foot and by car and when the bad guy manages to make it to the airport and board a just-departing plane, he gets a ticket for the next flight out and follows him across the country to finish things up in the baggage claim at LAX. GOD TOLD ME TO (1976): An NYPD detective (Tony Lo Bianco) investigates a series of bizarre crimes in which seemingly ordinary people commit horrific acts of violence (at one point, a cop played by Andy Kaufman opens fire on the crowd at the St. Patrick's Day Parade) and offer only the titular quote as an explanation. That couldn't possibly be the reason why. . . or could it? To say any more would spoil the number of surprises Cohen has up his sleeve but Cohen's ambitious attempt to offer twin meditations on the violent madness that seemed to grip American cities in the Seventies with the myriad ways in which religious beliefs have been poisoned and perverted over the centuries by people hoping to use blind faith as a way of furthering their own agenda results in one of the boldest, freakiest and discomfiting horror films of the decade. 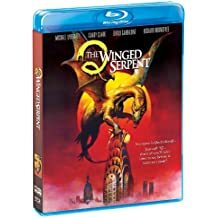 Q--THE WINGED SERPENT (1982): After being fired from directing an updated version of Mickey Spillaine's detective classic ''I, the Jury'' after only a couple of days of shooting, Cohen decided to leap immediately into a new project and within a matter of days pulled together the financing for this urban monster movie about an ancient Aztec creature attacking New Yorkers and a small-time crook (Michael Moriarity) who inadvertently discovers the creature's hiding place in the highest reaches of the Chrysler Building and attempts to score a million-dollar payout from the city for his information. Generally regarded as perhaps Cohen�s most entertaining film, this B-movie favorite has everything--a nifty monster, funny dialogue, a genuinely great Method performance by Moriarity leading an eclectic cast featuring the likes of Richard Roundtree, David Carradine and Candy Clark and a fabulous action finale featuring real people hanging from the tallest reaches of the Chrysler Building. The punchline--not only did Cohen manage to just beat the troubled ''I, the Jury'' into theaters, it wound up beating it soundly at the box office to boot. PERFECT STRANGERS (1984): Made back to back with the interesting ''Special Effects'' (in which a filmmaker on the ropes after a ''Heaven's Gate''-sized flop inadvertently films himself accidentally killing a would-be actress and decides to make his comeback with a fictional feature based around that footage), this thriller centers around a seemingly ordinary guy (Brad Rijn) who begins dating a woman (80s hipster goddess Anne Carlisle) who has just gotten out of a bad marriage and is raising her two-year-old son on her own. As it turns out, the too-good-to-be-true guy is really a hit man for the Mob who committed a murder that was witnessed by the pre-verbal child and begins the relationship with the mother in order to figure out if the kid can finger him for the crime or not, with bad news for mother and child if he can. Filled with ingenious little twists (such as the ex-husband trying to kidnap his son, a theoretically evil move that viewers paradoxically find themselves rooting for as a way of getting the child out of danger) and good performances, this is the kind of smartly told narrative that Hitchcock himself would have probably given his eyeteeth to do himself. THE STUFF (1985): When a mysterious substance bubbles up from the ground and proves to be delicious, it is swiftly marketed as a new dessert called The Stuff and, backed by a powerful ad campaign, becomes the most popular foodstuff in the country. Big Ice Cream hires a shady corporate spy (Michael Moriarity) to investigate and he makes the shocking discovery that the substance is actually a living creature that is consuming the minds of all who eat it as part of a plan to take over the world. As a horror film, this may not be the most terrifying thing imaginable--it is hard to get that worked up over a monster that looks like sentient Cool Whip--but as a scathing satire on a consumerist culture so brainwashed by the media that it is willing and eager to eat something that is literally killing them as long as it tastes good and it has a catchy ad jingle, it is clever and funny and, alas, still all too relevant today.